I'm so excited for everything that 2014 has to offer. Deep down, I know that the year is going to hold great things for me and for this blog....which, if you want to get technical, means that as one of my readers the year is going to hold great things for you, too! I'm admitting here to the the world, that I have let myself become a slob. I don't think anyone needs to call and get me on an episode of Hoarders yet, but I have let things slide. Did you know that everyday life becomes harder when your space is a mess? And then if something major happens, like, say a flood in the basement, it feels as though your space is closing in around you? Not a good feeling. And you know what? Being organized makes me happy. I LIKE seeing my colored pencils organized in cute mason jars by color. I LIKE having a binder organized with all my personal and financial information. I LIKE having my sheets neatly folded and stacked in the linen closet. Why have I been denying myself things that I enjoy? So my plans are to go item by item, room by room, until I've gotten rid of anything that is not essential and organize whatever is left. Clean up and clear out. Actually, I started in December and already have a pile of stuff to donate and took out two bags of stuff to throw away. And sometimes I do what I'm supposed to do, but only do it partway. I rationalize that I'll do it better later. That doesn't work either. When there is a job to do, dishes to be washed, a blog post to be written, I need to just do it.....without whining. I'd love any tips for how you avoid procrastinating. The internet is full of blogs, some new, some old, and some in between. A few years ago, blogging was such a new, fresh idea that there wasn't a whole lot to compare yourself to. Now, it is so easy to look at someone who has been blogging for years and be critical of everything that you are doing on your own. You look at their photography and wish your's was sharper, brighter, or staged better. You look at their writing style and wish you could write the same way. You look at their projects or recipes and wonder why you couldn't have come up with that idea yourself. The reason is because just like anything else, blogging takes time and practice (and patience, which is what I have the most trouble with in life.) If you look back at even your most favorite blogs that seem so "perfect" now, they have posts that don't have great pictures, posts that have projects or recipes that you aren't interested in, and probably have spelling errors and typos. I have a clear view of what I want my blog to look like, how I want my writing to sound, and what I want to create to share with my readers. But I'm not there yet, and that is okay. It is good to have something to aspire to, but I need to experience that time of growth and finding myself, too. There are many times that I work hard on a project, write what I feel is a great post, add some terrific pictures and put it all out there in the world. Then nothing happens. A few people look, a few people leave comments, but it goes nowhere. But then there are times that I get a lot of views and a lot of comments and a lot of pins, even months later. And to be honest, most of the time when that happens it is when I put a totally original idea out there. In life in general, it is a trap that is easy to fall into thinking that we have to be like everyone else, but what really stands out is originality. I really want to devote my time to being a creator....an originator (is that a word?). There is nothing wrong with being inspired by others, but it is a slippery slope when you turn from inspiration to pure copying. I have a lot of great DIY, craft, and decorating projects floating around in my head and I can't wait to share them all with you! After I started blogging, that is what my life became about.....everything revolves around how can I turn something into a post and my time is spent either thinking about, creating for, or promoting my blog. I spend time in the morning before work promoting my posts. I come home from work and create my projects and recipes. Then I spend hours after dinner writing my posts, editing my photos, and promoting my posts again. But you know what? I'm not efficient (obviously). I get sidetracked reading other people's blogs, browsing on Pinterest, re-re-re designing my blog. I need a plan. A schedule. And it needs to include time for fun and relaxing and less time being wasted. And my brain needs to shut off at the end of the night so that I'm not crafting and writing in my sleep. So those are some of my goals for the new year. 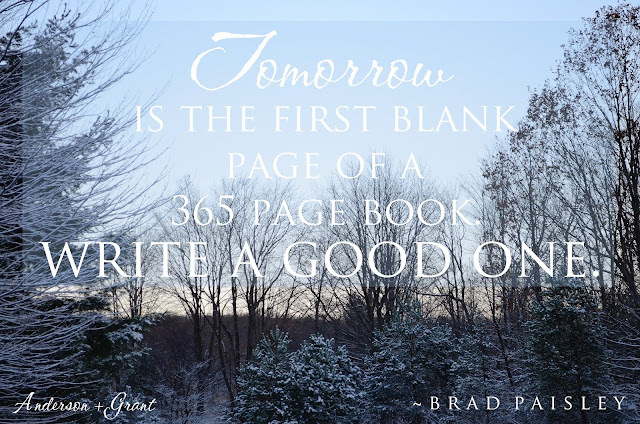 Have you created any resolutions for 2014? I hope that you have had a wonderful holiday season and are ready for your own fresh start. I'll be back next Monday, January 6, to begin my new posts for the new year!